Weaver’s Wildlife Control receives calls from homeowners, landowners, and farmers with concerns regarding extensive beaver damage to their property. Beavers are the largest North American rodent. Most adults weigh from 35-50 pounds, with some occasionally reaching 70-85 pounds. The beaver is a stocky rodent highly adapted for aquatic environments. Many of the beaver’s features enable it to remain submerged for long periods of time. It has a valvular nose and ears, and lips that close behind the four large incisor teeth. Each of the beaver’s four feet have five digits, with the hind feet webbed between digits and a split second claw on each hind foot. The front feet are smaller than the hind feet. The beaver’s underfur is dense and generally gray in color. Their guard hair is long, coarse and ranging in color from yellowish brown to black, with reddish brown being the most common coloration. Beavers have a prominent tail that is flattened dorsoventrally, scaled, and almost hairless. It is used as a prop while the beaver is sitting upright and for a rudder when swimming. Beavers also use their tail to warn others of danger by abruptly slapping the surface of the water. 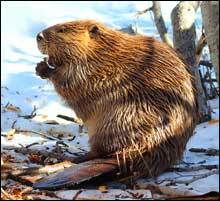 The beaver’s large front teeth, bright orange in color, grow continuously throughout its life. These incisors are beveled so that they are continuously sharpened as the beaver gnaws and chews while feeding, girdling, and cutting trees. Beavers are found throughout most of North America. Beavers are found almost anywhere there is a year-round source of water, such as streams, lakes, farm ponds, wetland areas, swamps, roadside ditches, drainage ditches, canals, and sewage disposal ponds. Beavers build dams to modify the environment more to their liking. Dam building is often stimulated by running water. Beavers are adaptable and will use whatever materials are available to construct dams. Beavers prefer trees and woody species, such as aspen, cottonwood, sweetgum, willow, black cherry, blackgum, tulip poplar, and pine. Beavers will eat leaves, twigs, and bark of most species of woody plants that grow near the water, as well as a variety of herbaceous and aquatic plants. Beavers often travel 100 yards or more from a pond or stream to get to corn fields and other crops. Beavers are active for approximately 12 hours each night except on cold winter nights. It is not uncommon to see beavers active during daylight hours, particularly in large reservoirs. Female beavers give birth to 3-4 kittens between March and June, and nurses them for 6 weeks to 3 months. Kittens are born fully furred with their eyes partially opened. Beavers communicate by vocalizations, tail slapping, posture, and scent posts or mud mounds placed around the dam or bank. The beaver’s castor glands secrete a substance that is deposited on mud mounds to mark territory. Beavers have a long life span, with individuals known to live 21 years. Most, however, do not live beyond 10 years. A colony of beavers consists of 4-8 relatives. Beavers have a few natural predators aside from humans, including coyotes, bobcats, river otters, and mink, who prey on young kittens. 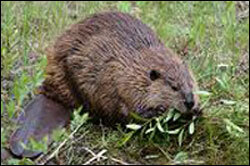 Beavers are hosts for several Ectoparasites and internal parasites including Nematodes, Trematodes, and Coccidians. Giardia Lamblia is a pathogenic intestinal parasite transmitted by beavers, which has caused human health problems in water supply systems. Most of the damage caused by beavers is a result of dam building, bank burrowing, tree cutting, and flooding. Beaver damage is extensive in the southeastern states. Damage has been estimated at 3-5 million annually for timber loss, crop loss, road damage, dwellings, and flooded property. It is almost impossible as well as cost prohibitive to exclude beavers from ponds, lakes, or impoundments. The use of traps in most situations where beavers are causing damage is the most effective, practical, and environmentally safe method of control. The effectiveness of any type of trap for beaver control is dependent on the trappers knowledge of beaver habits, food preferences, ability to read beaver signs, use of the proper trap, and trap placement. 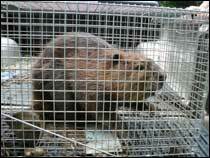 Weaver’s Wildlife Control has many years of experience and expertise in beaver trapping. We offer an integrated beaver management program that is proven to be successful. We can also install “Beaver Deceivers” and “Beaver Bafflers” on ponds and beaver dams for property owners who don’t want the beavers removed. Weaver’s Wildlife Control is ecologically responsible, ensuring that only environmentally sound solutions and humane wildlife removal techniques are used for beaver management.